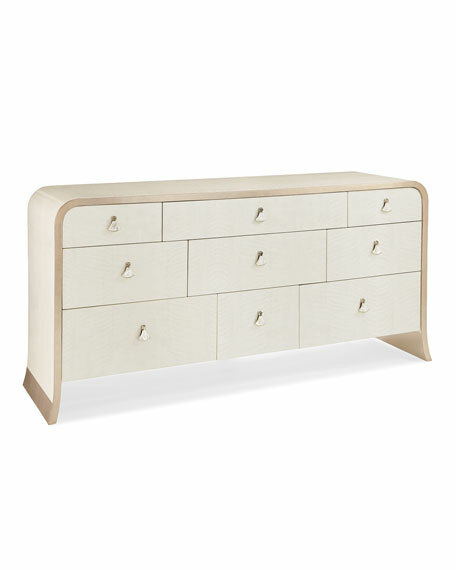 Soften the rigid lines in the bedroom with our beautifully flowing dresser. A gorgeous waterfall top and a pyramid drawer layout are just a couple of the little details that give this fluid dresser its graceful personality. The top left drawer features a removable jewelry tray. 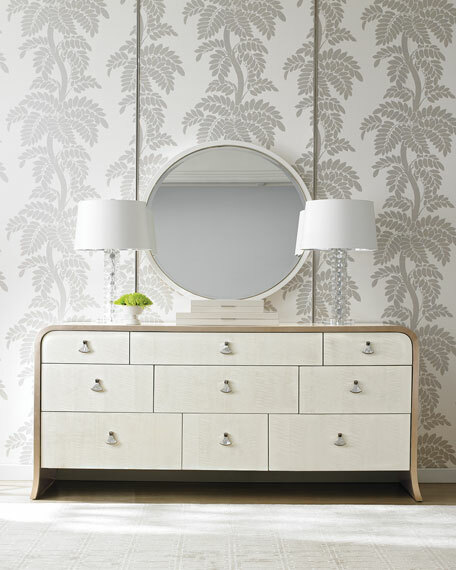 Fashioned from an Anigre veneer that showcases a highly, figured wood grain, its case is finished in Dreamy White and further embellished with a subtle Oracle silver leaf that defines its elegant profile. Handcrafted dresser with silver leaf finish. Poplar solids and figured anigre veneer. Removable jewelry tray in top left drawer. 73.8"W x 20"D x 35.5"T.
Boxed weight, approximately 326.3 lbs.